Bill Schwertfeger was born in 1945 in Enid, Oklahoma. He was commissioned a 2d Lt in the U.S. Air Force through the Air Force ROTC program at Oklahoma State University on June 30, 1967, and went on active duty beginning September 12, 1967. Lt Schwertfeger next completed Undergraduate Pilot Training and was awarded his pilot wings at Vance AFB, Oklahoma, in September 1968, followed by Pilot Systems Operator training and F-4 Phantom II Combat Crew Training at George AFB, California, from October 1968 to July 1969. His first assignment was as an F-4 pilot systems operator with the 433rd Tactical Fighter Squadron at Ubon Royal Thai AFB, Thailand, from August 1969 to June 1970, and he then attended F-4 pilot upgrade training at George AFB from June 1970 to April 1971. Capt Schwertfeger next served as an F-4 pilot back with the 433rd Tactical Fighter Squadron at Ubon Royal Thai AFB from April 1971 until he was forced to eject over North Vietnam and was taken as a Prisoner of War on February 16, 1972. After spending 407 days in captivity, he was released during Operation Homecoming on March 28, 1973, and was briefly hospitalized to recover from his injuries at Sheppard AFB, Texas. His next assignment was as an F-4 fighter weapons instructor and maintenance liaison officer with the 414th Fighter Weapons Squadron at Nellis AFB, Nevada, from September 1973 to June 1976, followed by service as an F-4 fighter weapons instructor with the U.S. Air Forces in Europe Tactical Employment School and the 406th Tactical Fighter Training Wing at Zaragoza AB, Spain, from June 1976 to June 1979. Maj Schwertfeger attended the Armed Forces Staff College in Norfolk, Virginia, from July 1979 to February 1980, and he then served as a Flight Commander and Deputy Chief of the F-4 Division at the U.S. Air Force Fighter Weapons School and the 414th Fighter Weapons Squadron at Nellis AFB from February 1980 to April 1983. His next assignment was as an F-15 Eagle pilot with the 49th Tactical Fighter Wing at Holloman AFB, New Mexico, from July 1983 to May 1986, followed by service as the Air Force Advisor to the Kansas Air National Guard at McConnell AFB, Kansas, from May 1986 until his retirement from the Air Force on June 1, 1988. After retiring from the Air Force, Bill flew over 10,000 hours in the Boeing 727 with American Airlines before retiring in October 2005. He also amassed over 3,500 flying hours in the F-4 and F-15 during his Air Force career. He was named the 2016 Air Force ROTC Alumni of the Year, and the 2017 River RAT of the Year for the Red River Valley Fighter Pilots Association. Bill married the former Vonya Scribner of Caldwell, Kansas, on March 22, 1969. 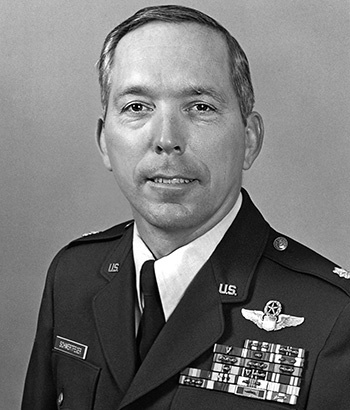 Captain William R. Schwertfeger distinguished himself by gallantry in connection with military operations against an opposing armed force as an F-4D Aircraft Commander in Southeast Asia on 16 February 1972. On that date, Captain Schwertfeger was the strike team leader on an air strike of highest importance deep inside hostile territory. Because photo reconnaissance of the target area was extremely limited, he was primarily tasked to locate and mark the targets for the strike flight which followed. With complete disregard for his own personal safety, Captain Schwertfeger remained in this extremely hostile environment for over two hours locating targets and directing strikes against these targets, despite continually receiving intense antiaircraft fire. By his courageous efforts, Captain Schwertfeger accounted for the destruction of two heavy field pieces, five antiaircraft positions, and a supply warehouse. Shortly thereafter his aircraft took a disabling hit forcing him down in hostile territory. By his gallantry and devotion to duty, Captain Schwertfeger has reflected great credit upon himself and the United States Air Force.